These objects are just a few of the more than 100 wearable technology pieces that are included at the Museum of Science and Industry’s (MSI) Wired to Wear exhibition, the first ever dedicated to wearable technology. Mateevitsi earned his Ph.D. in computer science, with a specialization in human augmentics from UIC’s Electronic Visualization Laboratory (EVL). Human augmentics can enable humans to see and hear better, absorb and interpret more information and increase physical endurance. Not all of human augmentics is what we would consider the stuff of science fiction: it can include eyeglasses or hearing aids. More recent technologies include robotic limbs, Bluetooth earpieces and biometric sensors. The EVL at UIC, where the human augmentics research is being pioneered, is an internationally renowned interdisciplinary research laboratory that enables scientific and engineering discoveries by designing and developing high-performance visualization, virtual reality, and collaboration systems using advanced networking infrastructure. Established in 1973 as a joint effort of the UIC College of Engineering and School of Art and Design, EVL is the oldest formal collaboration between engineering and art in the U.S. The original SpiderSense prototype had 13 sensors, located on the shoulders, wrists, chest, upper back, lower back and abs. SpiderSense technology works by vibrating to let the user know if they are approaching an object, or if an object is approaching them. It can be used by people who are visually impaired or people in the line of duty, such as soldiers or firefighters, who are in areas of low visibility. Mateevitsi worked on other tools during his time at UIC’s EVL, including developing 3D Visualization Software for the U.S. Air Force medical researchers, inventing the HealthBar, an ambient persuasive technology reflecting the health status of an office worker, and developing a client-server application enabling medical researches to upload image datasets to a remote database. While we wait, visitors to the Wired to Wear exhibit have the opportunity to test out SpiderSense. 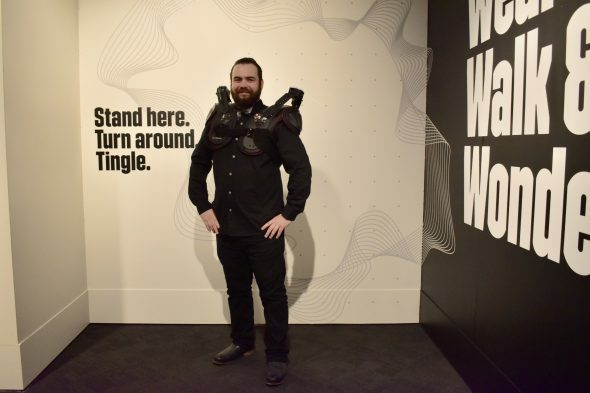 Using Mateevitsi’s concept, technological futurist firm Quantum XPR built out a vest for the exhibition, and guests navigate a space relying on the haptic feedback the vest provides to alert them to obstacles in close proximity. Mateevitsi’s first two prototypes are also on display. The Wired to Wear exhibition opened March 21. Wired to Wear is sponsored by BMO Harris Bank and will remain at MSI through May 2020. It is not included in Museum Entry and requires an additional timed-entry ticket, $12 for adults and seniors, and $9 for children. For more information on the exhibition, visit msichicago.orgor call 773-684-1414.